Creativity is a beautiful thing and so are weddings, especially when creativity has been put into good use. One great fact about wedding nowadays is how brides are getting more and more involved in all the little details of wedding planning. With increased interest in DIY wedding, you find yourself with many personalised and customised wedding elements that are precious and sentimental, such as DIY wedding invitations and stationery. Today, we will be looking into DIY wedding invitations templates and how it can be of use to you, and ways in which you can put them to use. With the internet, looking for inspiration is a breeze. Not only can you find so many ideas from wedding decor to stationery and also dresses, floral decor and so much more, but you can also find ways in which you can try out various designs to make your personalised element come to life. You can see this in terms of wedding dresses, and definitely with wedding invitations. If you have a template design in mind, what you can do is to draft the design and go in search of DIY wedding invitation kits and templates that go in line with it, and from there, you can add your accessories, embellishments and trims and see how they go best with the template you have in mind. There are many DIY wedding invitations templates and kits out there, and these includes the likes of no fold, bi-fold and tri fold cards, to square, rectangular, vertical, horizontal, pocket wedding invitations and more. Most of these DIY wedding invitation templates also come with measurements of either 180 mm x 96 mm (DL tri-fold/vertical), 145 mm x 145 mm (square), 134 mm x 134 mm (square vertical/horizontal/tri-fold/no-fold), 135 mm x 280 mm (square insert fold), 210 mm x 105 mm (DL vertical), 200 mm x 90 mm (DL no-fold), 180 mm x 90 mm (DL no-fold). Not forgetting the envelopes, they are available either in 220 mm x 110 mm for DL variety whilst the square DIY invites comes with a matching sized envelope, plain or in print. The likes of DIY Invitations allows you to customise the text in terms of colour, font typeface and the content itself prior to printing, and if you want to be sure before ordering, you can have samples delivered to you. Pick out your favourites from the DIY wedding invitations & stationery options and see which templates fit your liking & style, and order yourself a sample so you can see it for yourself. With DIY wedding invitation templates, you have a lot of fun doing up your wedding. This entry was posted in DIY Embellishments, DIY Envelopes, DIY Invitations Ideas, DIY Paper & Card Stock, DIY Wedding Invitations and tagged DIY Wedding Invitations, diy wedding invitation templates, diy brides, layered, hardcover, handmade, paper crafts, laser cut, paper cut, stickers, seals, unique envelopes, photographs, liners, diy envelope, washi tape, gift wrapping, watercolour, DIY invitation boxes, luxury, hardcover wedding invitations, accessory, paper stock, card stock, brides, easy DIY, punches, accessories, monogram, styling, unique, creative, stencils, DIY, stamps, ribbon, diy weddings, ribbons, styles, trends, design, australia, wedding invitation ideas, Handmade Wedding Invitations, Wedding Stationery, Wedding Invitations on July 8, 2014 by R2 Networks Administrator. Origami is an oriental style of art and craft, and essentially in definition and translation, it means to say “folding paper”, as “ori” translates to ‘folding’ whilst “gami” means "paper" (a connotation of kami). This Japanese art form has spread throughout the world. The beauty of the creations can truly marvel and the precision and patience it takes to make them truly tests one’s character. Therefore, when you opt to do up your DIY wedding invitations in a unique way, you might want to think of Origami and DIY Wedding Invitations. There are many types of origami, as well as techniques and materials, which you can use. In addition, when it comes to shapes there also various types you can come up with, whether it is to tie it up with your wedding theme, with the traditional ones being flowers, or even just something the bride and groom cherish and want to use as their wedding theme. In this edition of DIY Invitations Ideas, we have looked into a few ways, types and shapes of origami you can use for your DIY wedding invitation base using paper stock and accessorising with speciality wedding paper. Let us look at what you can do. Butterflies, whether they are real, photographs or even illustrations, they are all beautiful. For you to come up with something as an origami butterfly is so unique and unusual that could amaze your invitee trying to figure out how you did it. You can find yourself creating simple yet beautiful butterflies with patterned paper, or intricate complex ones as well. Lotus flowers are beautiful and are quite intricate depending on the type of origami you choose. No matter which one you choose, your outcome of a beautiful lotus flower will be quite spectacular. You can opt to use one large intricate lotus or many to form a design on your DIY wedding invitation. The choice is up to you. Roses have always held an esteemed place in wedding planning and even in origami; you will find these beauteous flowers quite popular. Decked in red, white or whichever colour you have chosen and with different folding types for a larger bloom or even bud, you can arrive at a beautiful design for the invite. Other shapes that you can make with origami for your DIY wedding invitations include the likes of a windmill, fish, peacock, wreath, seashells, horses, elephants, doves, swans, stars and many more. Start discovering now! This entry was posted in DIY Invitations Ideas, DIY Paper & Card Stock, DIY Wedding Invitations, Wedding Invitations Ideas, Wedding Speciality Paper and tagged DIY Wedding Invitations, origami inspired, diy brides, layered, hardcover, handmade, paper crafts, laser cut, paper cut, wedding paper, stickers, seals, unique envelopes, photographs, liners, diy envelope, washi tape, gift wrapping, watercolour, DIY invitation boxes, luxury, hardcover wedding invitations, accessory, paper stock, card stock, brides, easy DIY, punches, accessories, monogram, styling, unique, creative, stencils, DIY, stamps, ribbon, diy weddings, ribbons, styles, trends, design, australia, wedding invitation ideas, Handmade Wedding Invitations, Wedding Stationery, Wedding Invitations on June 25, 2014 by R2 Networks Administrator. Art in itself is a varied and diverse topic altogether, but here, we are talking about pencil art in the sense of how it can help in your wedding designs and using it on your DIY wedding invitations. Illustrations are quite the rave with wedding themes and stationery, but this is one style is one that is still very sentimental and rare. There are many types of pencil art out there, from charcoal to chalk, lead art, doodles and even colour pencil art, which are beautiful when the final masterpiece is revealed. When it comes down to what art is all about, there are many items you can feature on your wedding invitation. From a pencil art portrait of the couple, to details of the couple’s attire, such as the wedding dress sketch, or even illustrations of the wedding venue and various decor elements, that is the focal element of your special day. Usually, you find your wedding theme around a colour or an inspiration from a certain element. It could be the altar you plan on getting married at and the details around it, to the wedding cake topper, which can be anything from the traditional bride & groom to lovebirds, these elements can be found all across your wedding design, and therefore also featured on your wedding invitations and other wedding stationery. When you are planning on doing up your DIY wedding invitations, all you will need to acquire from your DIY stationery vendor would be the DIY wedding invitation kits (which consists of pre-scored/pre-cut DIY wedding invitations or printable invitation templates), and from thereon, put artistry to the test. If you are an artist in question, then it is up to you to do up some great sketches and designs. If not you can also hire someone who is gifted with the creative skill of pencil art, and have them create a masterpiece for you. If that artist in question is also gifted in calligraphy, then you are crossing out two items on your to-do list, the illustrations and design, as well as the invitation wording that needs to be done on your DIY wedding invitations. For those couples who are getting married at great landmarks in Australia, your DIY wedding invitations can feature them so that everyone will know where you are getting married from the moment they have your wedding invite in hand. If you are planning to have your ceremony at the Sydney Harbour, then by all means, feature the beauty of architecture of this great landmark as your focal element on your wedding invite using pencil art. Like so, there are so many ways you can do up your DIY wedding invitations and stationery. Think of the great possibilities, and try them out through samples before committing to it and clear all doubt. This entry was posted in DIY Invitations Ideas, DIY Paper & Card Stock, DIY Wedding Invitations, Wedding Speciality Paper and tagged DIY Wedding Invitations, diy brides, layered, hardcover, handmade, paper crafts, laser cut, paper cut, stickers, seals, unique envelopes, photographs, liners, diy envelope, washi tape, gift wrapping, watercolour, DIY invitation boxes, luxury, hardcover wedding invitations, accessory, paper stock, card stock, brides, easy DIY, punches, accessories, monogram, styling, unique, creative, stencils, DIY, stamps, ribbon, diy weddings, ribbons, styles, trends, design, australia, wedding invitation ideas, Handmade Wedding Invitations, Wedding Stationery, Wedding Invitations on June 18, 2014 by R2 Networks Administrator. In a world where arts & crafts play a big role in families and homes alike, weddings are also taking a whirl of the DIY trend. That is why more and more brides are taking to their inner creativity for a DIY wedding. Find out how you can be creative to come up with DIY wedding invitations using the likes of watercolours, stamps and stencils. When it comes to these three main materials that can be used for DIY wedding invitations, the initial thing you have to do is figure out a colour or a colour theme, or even a style theme for that matter, to jump start you in the right direction. Once that is done, and you know what you want to do, you need to acquire the base for your creation, which would be the DIY wedding invitation paper or even DIY wedding invitation kits. Stamps, (by stamps I mean the ones which are associated with Stampin’), offers various illustrations already etched into rubber or wood that only requires some ink to convert the object on the paper, and presto, you have yourself a beautiful illustration on your DIY wedding invite. Most couples opt for this type of tool when they want something intricate that cannot easily be drawn by hand in bulk. However, that does not mean you cannot use it for larger more simple designs as well. The use of such stamps saves you the times of replicating your illustration and gives you a more natural feel as opposed to having it printed, as it looks more authentic. With such as DIY tool you can also use various methods of colouring them too, from coloured pencils and pens, to crayons and watercolours too. Stencils on the other hand, though similar to stamps, they are best used for creating patterns and coloured using the same options too. Stencils are great when you have to keep it neat, tidy and precise. 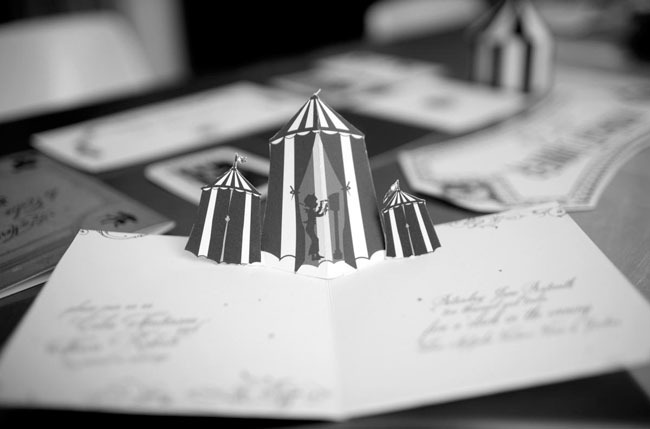 This way you are assured that a certain design is replicated throughout the wedding invitation pack. When it comes to watercolours, though it can be used with stamps and stencils both, watercolours can be used on its own, because the picture you draw can be done in a way that you wish. Its best to opt for this if you are an artist, because getting the same illustration right every single time can be quite difficult, and that is why stencils and stamps were introduced, to make life and wedding tasks easier. Therefore, find out which method suits you best and go with it. Carry out some samples and then choose which one proves to be the easiest and the best looking, and then you will have your DIY wedding invitation winner. This entry was posted in DIY Invitations Ideas, DIY Wedding Invitations and tagged DIY Wedding Invitations, diy brides, layered, hardcover, handmade, paper crafts, laser cut, paper cut, stickers, seals, unique envelopes, photographs, liners, diy envelope, washi tape, gift wrapping, watercolour, DIY invitation boxes, luxury, hardcover wedding invitations, accessory, paper stock, card stock, brides, easy DIY, punches, accessories, monogram, styling, unique, creative, stencils, DIY, stamps, ribbon, diy weddings, ribbons, styles, trends, design, australia, wedding invitation ideas, Handmade Wedding Invitations, Wedding Stationery, Wedding Invitations on June 11, 2014 by R2 Networks Administrator. Every wedding has to have a bouquet as an accessory for the bride, and over the years, bouquets have become such unique features that it has become an inspiration for many a thing. Therefore, in this instalment of DIY Wedding Invitations, we bring you Bouquet Inspired DIY Wedding Invitations. If you already have a colour scheme selected, then all you will need to do is figure out the texture of the DIY invitation paper and the inspiration to decorate it in a way that blends well with your wedding theme. Now, if you are using DIY wedding invitations kits, you have the ease of having your entire guest list printed as well as the invitation wording and more. When selecting your DIY invites, make sure you have some idea of the layout because it will be delivered to you so that they will be ready to have other wedding invitations and accessories attached to it. Now, onto the matter of what you can use to decorate these DIY wedding invitations, we have a few ideas in mind. Let us find out more about them, shall we? Beaded bouquets are cute and dainty, and definitely different from any wedding bouquet you have seen. They can be considered a little sparse, but you can accessorise with accompanying materials. Like so, you can add beads or beaded strings, to blend well with your bouquet, ensuring that the colour scheme is the same. There is also the option of handmade wedding invitations from scratch, which involves adding beaded buckles with lace or ribbons. That is just one option you can take. Another unique bouquet you can use is twigs as the main attraction. Add a rustic touch to your DIY wedding invitation with this accessory. Brooches are lovely additions to weddings, but you can break the mould by opting for a bouquet of brooches and make it truly beautiful. Your DIY wedding invitation would be a brooch too, giving your invitees a wedding keepsake with your invite as well. Fan Shaped Bouquet is something that is unheard of but entirely possible. So, shape your wedding bouquet in that manner and decorate your wedding invite to resemble a handheld antique fan as well. Feathers are lovely to behold and the colours are truly spectacular. You can add a single feather or numerous ones to accessorise your DIY wedding invitation. Buttons, similar to brooches can be ornate and beautiful. So find yourself admiring the beauty of your bouquet and your wedding invite when you opt for this accessory. Wires are similar to twigs but can be shaped to your liking. Deck your bouquet with some lovely designs and use that as inspiration for your design on the DIY wedding invites. Fruits and Vegetables are great additions to your decor and using them for your bouquet is quite creative. Use inspiration from the fruits and vegetables, from the colours or shapes and use it in the decor and design of truly unique wedding invites. Fabric Bouquets as also great options, and are cost efficient. When making your fabric flowers, have a few more made for your DIY wedding invites, and use it as the highlights of the floral invitation and blend your wedding elements together. This entry was posted in DIY Embellishments, DIY Paper & Card Stock, DIY Wedding Invitations, Wedding Invitations Ideas, Wedding Speciality Paper and tagged DIY Wedding Invitations, unique designs, bouquets, diy brides, layered, hardcover, handmade, paper crafts, laser cut, paper cut, stickers, seals, unique envelopes, photographs, liners, diy envelope, washi tape, gift wrapping, DIY invitation boxes, luxury, hardcover wedding invitations, accessory, brides, easy DIY, punches, accessories, styling, unique, creative, DIY, stamps, ribbon, diy weddings, flowers, ribbons, styles, trends, design, australia, wedding invitation ideas, Handmade Wedding Invitations, Wedding Stationery, Wedding Invitations on June 4, 2014 by R2 Networks Administrator.